Eastern junior Isaiah Fish drops down a bunt during the Eagles’ 11-1 victory over Southern on Thursday in Tuppers Plains, Ohio. TUPPERS PLAINS, Ohio — Even on somewhat of an off night, the Eagles continue to soar. 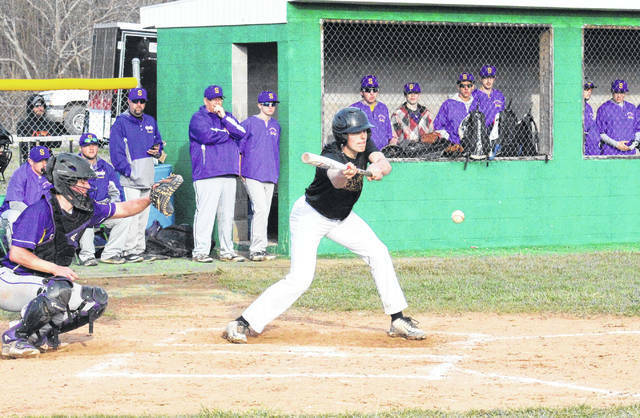 The Eastern baseball team was held to a season-low six hits on its home field Thursday evening, but that didn’t stop the Eagles from defeating Tri-Valley Conference Hocking Division guest Southern by an 11-1 count in five innings for their eighth straight win to start the year. 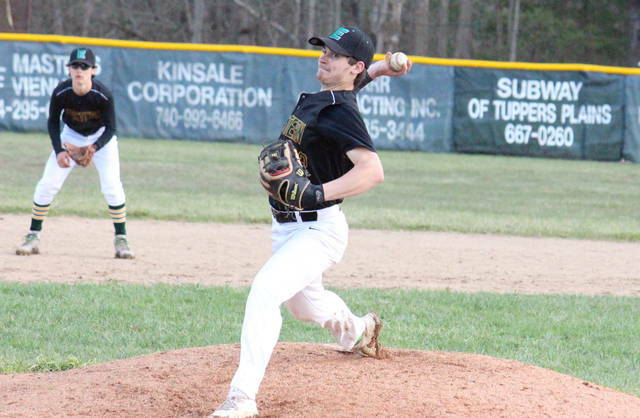 After retiring the Tornadoes (1-1, 1-1 TVC Hocking) in order in the top of the first inning, Eastern (8-0, 4-0) scored three runs on four walks, one hit, an error and a hit batter in the bottom of the frame. Following a scoreless second, the Eagles added one run to their lead in the bottom of the fourth when Josh Brewer doubled and then scored on an error. In the top of the fourth inning the Tornadoes got their first hit of the game, a one-out double by Logan Drummer, who came around to score on a two-out single by Jensen Anderson. Southern loaded the bases in the fourth, but a strikeout ended the inning with EHS still in front 4-1. Eastern got the run right back in the bottom of fourth, as a bases loaded walk brought Nate Durst around to score. After a single to lead off the top of the fifth, the next three Tornadoes hit flyouts. The Eagles made it a 6-1 game with Isaiah Fish scoring on a bases loaded walk, and then Austin Coleman singled home Owen Arix and Matthew Blanchard. Durst scored on an error and then Brewer doubled home Coleman and Ethen Richmond, giving the hosts an 11-1 mercy rule win. Coleman was the winning pitcher of record in a complete game for the Eagles, striking out three and allowing one run on three hits and two walks. 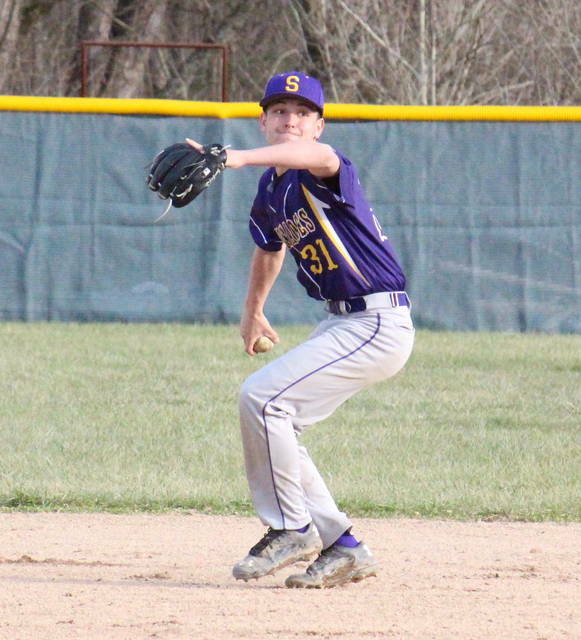 Jensen Anderson suffered the setback in 3.2 innings on the mound for SHS, striking out one and allowing five runs on four hits, six walks, and two hit batters. Gage Shuler finished the night on the mound for the Tornadoes, giving up six runs on two hits and four walks. Brewer led the Eagle offense with a pair of doubles, one run scored and two runs batted in. Kaleb Hill finished with one single and three RBIs, Coleman had one single, two runs and two RBIs, while Durst and Richmond both singled once, scored twice and drove in one run. 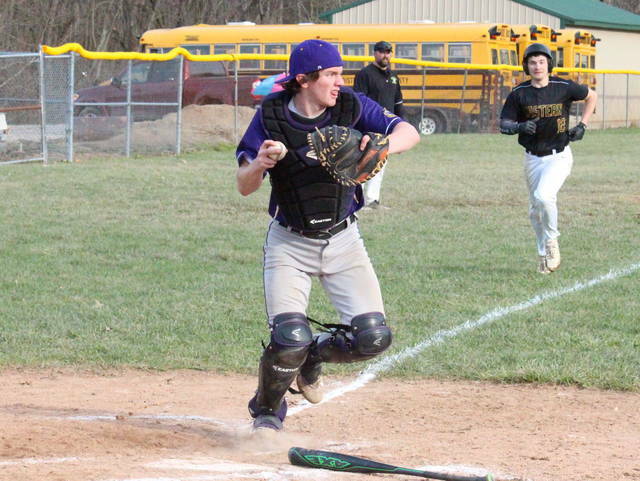 Ryan Harbour picked up an RBI for the hosts, Blanchard scored a pair of runs, while Fish and Arix scored a run apiece. Drummer doubled once and scored once to lead the Tornadoes, while Anderson and Logan Dunn both singled once, with Anderson earning an RBI. The Eagles committed one error and left seven runners on base, while Southern had four errors and four runners left on base. These rivals are scheduled to meet again on April 23 in Racine. After heading to Paint Stadium to face Toronto on Friday, the Eagles will be back on their home field to welcome Wahama on Tuesday. After hosting Miller on Friday and Meigs on Saturday, Southern is scheduled to visit Trimble on Monday.